When you register a domain name, it's yours for the period of time you registered, which is typically between one and 10 years. If you want to keep using it, including all of the services associated with it (like a website or email service), you have to renew it with your registrar before it expires. If you don't, you risk losing it for a short time or possibly for good. ICANN does not have the authority to transfer domain names, including expired ones, back to you. The process of ensuring that your domain name registration stays current isn't complicated, but it's important to understand the process and your responsibilities before you are at risk of losing this valuable asset. Stay informed about your registrar's terms and conditions regarding your domain name's expiration, make payments associated with your domain name on time, and be sure to keep your contact information up to date with your registrar so that you receive updates and renewal reminders. Registrant Blog Series - Do you have a domain name? Here's what you need to know. Part V: Renewing Your Domain Name. 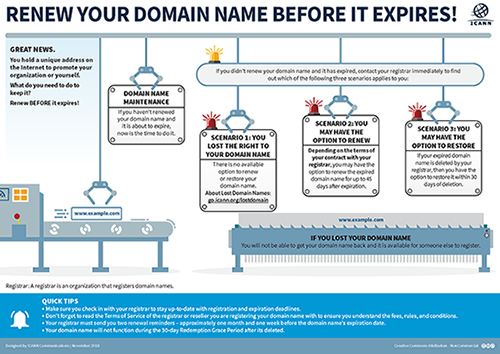 See Infographic: Renew Your Domain Name Before It Expires! Watch Video: How do I renew my domain name? If you have suggestions or would like to submit an inquiry, please contact ICANN organization's Global Support Center's Global Support Center.